Markers are fun. They’re not the type of thing one thinks of as a serious art supply, though. When one says markers, one most often thinks of the Crayola variety. 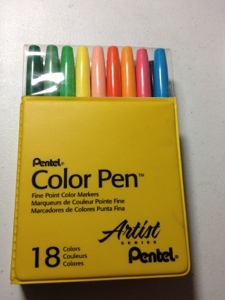 But I have here a set of 18 Pentel color pen – fine point markers. I wonder how they compare? First thing, the pentel is is not to be used at all like a Crayola marker. It is thin, like a pen, and obviously can’t be pressed. They don’t fill very well, so coloring is not and option. But that is not really what one would be doing with these. They make a very fine line, almost like a ballpoint pen, but thicker. It is suited to detail work. They are good for mixed media or a sketch style. 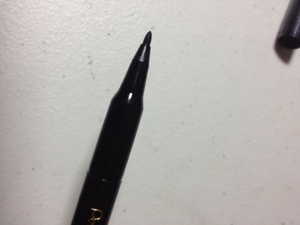 Blending is an option and a good one with these pens, in my opinion. They are not particularly suitable for larger images, however, because of their small size. They may even work better as just regular pens (even for writing) than as a marker. The body of the pen is slick but holdable. 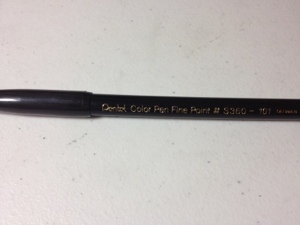 The side is marked with gold lettering that indicates what they pen is, but it is hard to read and rubs off easily. The lids do not snap into place but they do fit snugly enough to not dry out after extensive periods of time. I have had them for long enough to confirm this. The case fits all of them and keeps them organized with ridges. The top folds over and Velcro’s shut preventing the markers from falling out. These pens are very nice but not exactly like the markers. They are more like colored pens but with felt tips. While they have a very limited application range they are very nice and quite usable. They are however, quite expensive little things, especially for how quickly they can be used, I would only recommend getting them if you do have a known use for them.